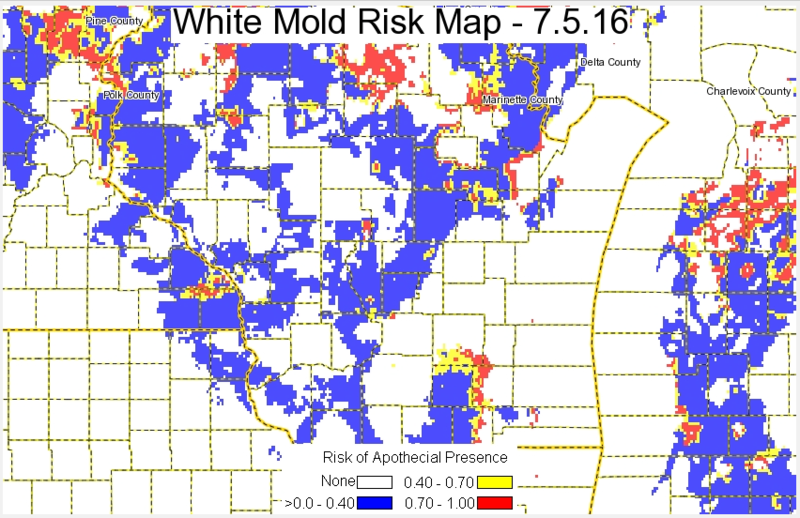 Risk of apothecial presence and subsequent white mold development remains generally low for most of Wisconsin today. Risk has increased slightly across the state over the holiday weekend with some isolated pockets in the northern and south-central areas of the state. The UW Field Crops Pathology crew has been scouting for apothecia in fields in the soybean growing areas of south and central Wisconsin and HAVE NOT found any apothecia. This confirms the generally low risk currently being predicted by the model. Growers near higher risk pockets should monitor the soybean crop for closing canopy and flowering growth stages that may lead to increased risk of white mold. We have seen numerous fields this week already in the R1 growth stage. Be sure to consult the how-to guide for assistance in interpreting this map if you are considering spraying fungicide to control white mold.